Stabilizing orthosis for stabilization of the thumb saddle and first metacarpophalangeal joints. Following thumb joint injuries, such as tears or sprain to the collateral ligaments (“skier’s thumb”), or for indications of osteoarthritis (arthrosis of first carpometacarpal joint) or irritation, RhizoLoc stabilizes the thumb saddle and metacarpophalangeal joint. A Velcro® tab allows the mobility of the joint to be limited as treatment requires. GOOD NEWS FOR SKIER’S THUMB SUFFERERS! With its Velcro fastenings, the orthosis can easily be put on and taken off by the patient. 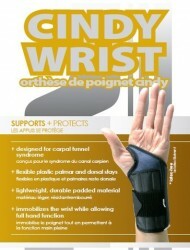 The orthosis can be adapted to the patient’s individual thumb size by means of the adjustable thumb tab. The breathable material with its integral pores allows air to circulate, thereby preventing the skin underneath from becoming sweaty or itchy. The RhizoLoc therefore sits securely in an anatomically correct and comfortable position on the hand for effective therapy. Active support for muscular stabilization of the lumbar spine. Many people who suffer from chronic back pain reach regularly for the painkillers. This can be harmful for their health. LumboTrain has no side effects. Wearing a LumboTrain® orthopedic brace is a helpful way of reducing back pain and becoming more mobile – with no need for pain medicine. The three-dimensional knitted fabric of the LumboTrain® provides support in the lumbar region. The breathable, skin-friendly material adapts perfectly to fit any body shape. LumboTrain Lady is also specially designed for the female body. The soft edges ensure it will not dig into you, and even if you wear it for a long time, it feels as comfortable as a supporting hand on your back. Velcro fastenings and practical hand straps allow for easy application and adjustment, even for people with arthritis. Stabilizing support for relief of the lumbar spine. LordoLoc is suitable for use as a back support for the stabilization of the lumbar spine, for example in the event of chronic lumbar vertebral syndrome. The stabilizing orthosis with four 91/4″ integral anatomically contoured flexible lightweight aluminium stays has a muscle-activating effect, relieves the spine and is very low-profile. The degree of stabilization can be adjusted to provide optimal individual support to the lower back. LordoLoc is characterized by its extremely thin yet effective construction. The supple support consists of two adjustable straps and four 91/4″ corset stays made of flexible lightweight aluminum inserted at the back. The rods support the spine if an activation of the musculature alone is not sufficient. The tighter the upper strap is fastened, the greater the stabilization. The corset stays can be individually reshaped for a perfect fit. The stays provide extra support if muscular activation is not enough. For shoulder complaints following injury or surgery, or caused by osteoarthritis, OmoTrain stabilizes the shoulder joint and provides secure joint guidance during movement thanks to its special strap system. The support activates the muscles and exerts a beneficial intermittent compression massage on the soft tissues, thereby relieving pain. If required, a removable massage pad (Delta pad) can provide additional massage for specific pain spots. In conservative treatment for the shoulder, secure guidance of the injured joint and carefully controlled mobilization are often key factors for successful healing. It is therefore also important to relieve pain in order to encourage mobility. With its compression knit and the tensile effect exerted by its special strap system, the OmoTrain centers the shoulder joint and protects it against painful circular movements. However, it also provides support for other movements, such as the lateral lifting of the arm, in order to strengthen the musculature. 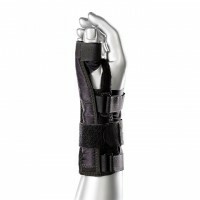 The full pain-relieving effect of the brace is produced during movement. During movement, the compression knit exerts a beneficial intermittent compression massage that activates the metabolism and helps to reduce swelling more quickly. The Delta pad increases this massage effect, thanks to its nubs and its joint-cavity ridge that have a targeted effect on specific pain spots. When necessary, the Delta pad can be attached into the support and positioned as required. The brace is easy to put on and take off thanks to its high elasticity, and it is secured to the upper body by means of a soft strap. 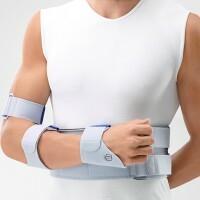 The chest area is left free, so the brace is particularly comfortable to wear. The OmoTrain is available as a universal version and can therefore be worn on either the left or the right. The breathable, anatomically contoured compression knit adapts to fit the shoulder perfectly and does not cause discomfort during movement. Support is therefore provided for the healing process, pain is reduced and mobility improved. P3 stands for “permanent patella protection” – because the GenuTrain P3 protects the patella (kneecap) securely during every movement. The kneecap is centered using a specially shaped massage pad with high sides and inward-facing silicone dots for exerting pain-relieving compression on Hoffa’s fat pad. An adjustable corrective strap helps to protect the kneecap from drifting sideways and can be tightened to various degrees depending on the loading situation. A second wedge-shaped massage pad at the upper outside edge of the brace slightly eases the pressure on the tendons connected to the kneecap, thus minimizing the outward pull. This provides relief for the kneecap and support during its natural movement. The braces’s compressive knit and two pads exert a pain-relieving massage effect during movement, which helps to reduce swelling more quickly and activates the muscles that stabilize the joint. GenuTrain A3 (“anti arthros algos” = “against joint pain”) uses intermittent compression massage to treat the typical pain points in the knee. The three-dimensional Train knit helps the muscular stabilization of the knee joint. 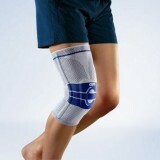 The integrated visco-elastic pad prevents the kneecap from slipping, combats pain and massages the surrounding tissue. Edemas and effu-sions can be relieved more quickly. The construction of the GenuTrain A3 and the material used guarantee that the brace is both medically effective and a comfortable fit: with a softer knit in the hollow of the knee, pressure-reduced edges, breathable materials and an elastic shape adapted to suit the body shape. Two spiral stays located on the sides retain the shape of the brace. The skin underneath thus remains pleasantly dry, and nothing is constricted. The GenuTrain orthopedic brace consists of an anatomically contoured knit and an integral, ring-shaped, functional visco-elastic cushion, the Omega pad. 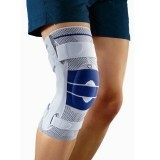 It relieves pain by providing the therapeutic pressure of the brace from the kneecap to the soft tissues of the knee. Two nubs on the lower edge of the pad, the Hoffa pads, exert pressure on the infrapatellar fat pad, thereby also increasing relief for the kneecap and enhancing the pain-relieving effect. Lateral wings extend into the joint space of the knee, providing targeted pain relief at the meniscus in this sensitive area. When walking or running with the GenuTrain, the muscular contractions cause the pressure to rise and fall, thereby resulting in an effect which is similar to an intermittent compression massage. This stimulates the metabolism and helps to dispel swelling and hematomas more quickly. The brace also stimulates receptors in the soft tissue of the knee and on the skin. The surrounding musculature is also activated and effective, long-term stabilization for the joint is achieved. The material and shape of the GenuTrain orthopedic braces have an ingenious functional design for optimal effect and a high level of wearing comfort. The breathable, skin-friendly knit adapts to your every movement, without irritation or slipping. The material is far softer and more elastic in the sensitive flexion area of the hollow of the knee, and at the edges of the brace. Spiral stays at the sides make sure that the brace does not lose its shape during movement, while integrated donning aids make the braces easy to put on with little effort. In the GenuTrain S (S for splints), lateral joint splints guide the knee’s movements. The bars can be heated and reshaped and can therefore be adjusted to the anatomy of each individual. The joint muscles are stabilized further by the elastic Train Active Knit with its integral pad. The integral elastic padded ring round the kneecap cannot slip. It helps to position the brace correctly and adapts itself to the angle of the knee joint during every movement. This produces a massage effect which activates the surrounding muscular tissue and stimulates circulation. The GenuTrain S, with its medically effective interaction of compression and massage, accelerates the reabsorption of edema and effusions. Muscular control is improved and the knee receives more stabilization. The arm sling immobilizes the joint straight after surgery or after reduction of a dislocated shoulder. The open and light construction of the orthosis makes maintaining personal hygiene easier, particularly around the wound. The OmoLoc, made up of the pelvic/abdominal strap and three individually adjustable arm loops, holds the arm in the 0-degree abduction position and keeps the elbow bent at 90-100 degrees. Limiting movement reduces pain and stabilizes the surgical outcome. The arm loops can be positioned freely along the abdominal strap to suit the patient’s individual anatomy. The arm sling is easy to put on and can also be worn by the patient at night. The material is comfortable and does not cause skin irritation. No shoulder strap is required to wear the OmoLoc. This avoids incorrect posture and the related tension that occurs in the healthy shoulder. The SP Walker™ low rocker sole promotes more natural ambulation for improved mobility while the generous foot base has ample room for dressings without sacrificing comfort. The lightweight, trimmable, semi-rigid shell has a pre-inflated anterior aircell and two adjustable aircells located at the malleoli that can be individually inflated for “total contact” fit and secure support. Elastic/Lycra construction provides moderate compressive support without restriction. Closed heel design with low profile elastic contact closure figure eight straps for medial/lateral and arch support. Lightweight material allows for ease of application. Fits right or left foot. Ideal for mild ankle sprains and strains; edema control; tendonitis; osteoarthritis. Dynamic support for gentle relief from inguinal hernias. Constructed with Bio Skin’s patented Ultima 2s™ material, the Wrist/Thumb Spica features a thin layer of ultra-soft micro-fleece against the skin, which wicks moisture away from the body, keeping you cool and dry. 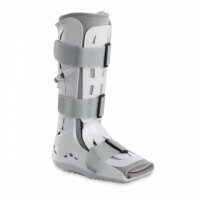 The brace has no laces so it can easily be applied with one hand. The Wrist/Thumb Spica protects the thumb and wrist against painful movement while allowing full use of the fingers. Recommended Use: Helps the body to metabolize carbohydrates and fats. 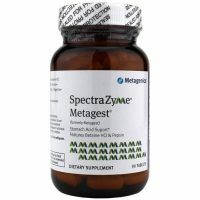 Provides support for healthy glucose metabolism . Recommended Dose: Adults take 1 tablet twice daily or as directed by your healthcare practitioner. Caution: Consult a healthcare practitioner prior to use if you have a kidney disorder and/or diabetes. Do not use if you are pregnant or breast-feeding. Consult a healthcare practitioner for use beyond 6 months. Do not use if perma seal is missing. Non-Medicinal Ingredients: Cellulose, stearic acid (veg. ), and croscarmellose sodium. Hops is traditionally used in Herbal Medicine to help relieve nervousness (sedative and/or calmative). Hops is traditionally used in Herbal Medicine as a sleep aid (hypnotic). Hops is traditionally used in Herbal Medicine as an aromatic bitter to aid digestion. Recommended Use: Hops is traditionally used in Herbal Medicine as an aromatic bitter to aid digestion. Recommended Dose: Adults take three tablets daily or as directed by your healthcare practitioner. Caution: Consult a healthcare practitioner if symptoms persist or worsen, if you are pregnant, breastfeeding, taking medications, or if you have depression and/or related diseases. Consumption of hops with alcohol, other medications or natural health products with sedative properties is not recommended. Some people may experience drowsiness. Exercise caution if operating heavy machinery, driving a motor vehicle or involved in activities requiring mental alertness. Hypersensitivity has been known to occur; in which case, discontinue use. Do not use if perma seal is missing. Non-Medicinal Ingredients: Cellulose, stearic acid (veg. ), croscarmellose sodium, sodium starch glycolate, silicon dioxide, and coating (water, hypromellose, hydroxypropylcellulose, medium chain triglycerides , and sodium copper chlorophyllin). 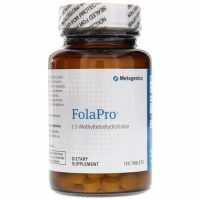 Recommended Use: Helps to maintain good health and prevent neural tube defects when taken prior to becoming pregnant and during early pregnancy in individuals with increased folate requirements due to reduced folate metabolism . Caution: Keep out of reach of children. Folate supplements may mask a vitamin B12 deficiency. Consult a healthcare practitioner if you are uncertain whether or not you are taking adequate vitamin B12. Do not use if perma seal is missing. 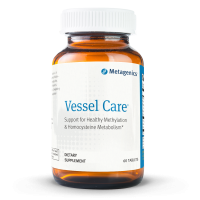 Recommended Use: To support healthy homocysteine metabolism and cardiovascular health. Caution: If pregnant or breast-feeding, or taking medications, consult your healthcare practitioner before use. Do not use if perma seal is missing. Non-Medicinal Ingredients: Cellulose, calcium silicate, stearic acid (veg. ), croscarmellose sodium, magnesium stearate (veg. ), and coating (hypromellose, maltodextrin, and polyethylene glycol). Recommended Use: To support cardiovascular health and as an antioxidant for the maintenance of good health. Recommended Dose: Adults take 1 chewable gel daily or as directed by your healthcare practitioner. Caution: Consult a healthcare practitioner prior to use if you are pregnant, breast-feeding, taking blood pressure medication, or taking blood thinners. Do not use if perma seal is missing. Non-Medicinal Ingredients: Sunflower oil, xylitol, water, sorbitol, gelatin, trisodium citrate, malic acid, tutti frutti flavour, lycopene, natural raspberry flavour, natural apple flavour, and natural cherry flavour. Recommended Dose: Adults take one tablet 3 times daily with each meal or as directed by your healthcare practitioner. Consult a healthcare practitioner for use beyond 12 weeks. Caution: Do not use if you are pregnant, breastfeeding, or have excessive stomach acid, gastritis, gastroesphageal reflux disease (GERD) or peptic ulcer disease. Consult a healthcare practitioner prior to use if you have cardiovascular disease ; if you have diabetes; if you have gastrointestinal lesions/ulcers, are taking anticoagulant agents or antiinflammatory agents, or are having surgery. Occasional nausea, vomiting, and diarrhea have been reported. Hypersensitivity (e.g. allergy) has been known to occur; in which case, discontinue use. Do not use if perma seal is missing. Non-Medicinal Ingredients: Cellulose, stearic acid (veg. ), silicon dioxide, magnesium stearate (veg. ), and coating (hypromellose, hydroxypropylcellulose, and medium chain triglycerides ).